LHASA: When Dechen Narum, along with her 10 siblings, used to lie on the grass on a rare sunny day to warm her feet more than 50 years ago, she could have never imagined the end of slavery in her land of lords and lamas. "My father, a shoemaker, used to work round the clock, but could never find time to make shoes for any of his children," Dechen, now 74, said. Dechen thought they had lived as slaves and would die as slaves. A day to commemorate the abolishment of slavery was not even a passing thought. But now, the impossible has occurred. And Dechen has lived to see it. A landmark bill that sets March 28 as a holiday to mark the abolishment of slavery in Tibet, which until five decades ago was dictated by a feudal serf system, will be tabled today during the 2nd annual session of the 9th Tibet Regional People's Congress. The verdict on the bill will be announced on Monday, Legqog, chair of the regional congress standing committee, told a press briefing yesterday. Relaxing in her recently renovated, spacious Tibetan house with a cup of buttered tea and a handful of fried highland barley, Dechen said she had "already lived the impossible dream of freedom for half a century". "And now, a holiday to celebrate it every year is like icing on cake," she said. The abandonment of slavery in March 1959 was simultaneous with the central government's Democratic Reform in the region, which emancipated serfs - who made up 95 percent of old Tibet's 1 million population - and allowed them to work on their own fields for the very first time. "Tibet has since embarked on a glorious path from darkness to light, from backwardness to progress, from poverty to prosperity, from dictatorship to democracy and from isolation to openness," said Legqog, who himself grew up in a serf family in Tibet autonomous region's (TAR) Gyangze county. "The celebration of this day has extremely important implications both practically and historically," the 65-year-old said. Tibet is widely believed to be the last place to have abolished serfdom. "Although Tibet was peacefully liberated in 1951, the evil Statue of old Tibet had still been in place as per the 17-Article Agreement between the Central People's Government and the local government of Tibet," recalled Dechen. "Those were the days when people were born into one of the nine social classes, and where lives were defined by law according to those classes. We the lowly people had nothing to look forward to," she said. The central government foiled an attempted armed rebellion led by the 14th Dalai Lama and his upper class supporters on March 10, 1959. Then premier Zhou Enlai issued a decree of the State Council on Mach 28 of that year, dissolving the region's aristocratic government and ordering the Preparatory Committee for the founding of the TAR to exercise local power. Legqog noted that "through vivid contrast between the cruelties of feudal serfdom and the people-centered approach of the Party, and especially since the March 14 riot, all Tibetans have recognized the reactionary nature of the Dalai clique and confirmed their confidence and determination to be with the Party." "After all these happy years for us, it's a shame that the Dalai Lama is still trying to ruin things and reinstall serfdom," Dechen said. According to Hu Yan, a Tibetologist at the CPC Central Committee's Party School, the establishment of the March 28 holiday aims not only at remembering the historic event but also at educating the region's youngsters about the significance of the day. "While most former slaves, who are still alive, are in their 70s or 80s, many youngsters in Tibet have no idea what an adverse life their forefathers have lived 50 years ago," Hu said. 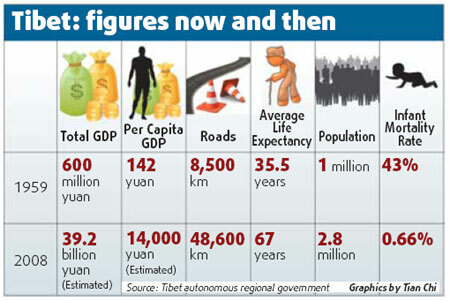 Despite tremendous losses after the riot, Tibet's GDP in 2008 was still estimated at 39.2 billion yuan ($5.7 billion), 65 times more than that in 1959.